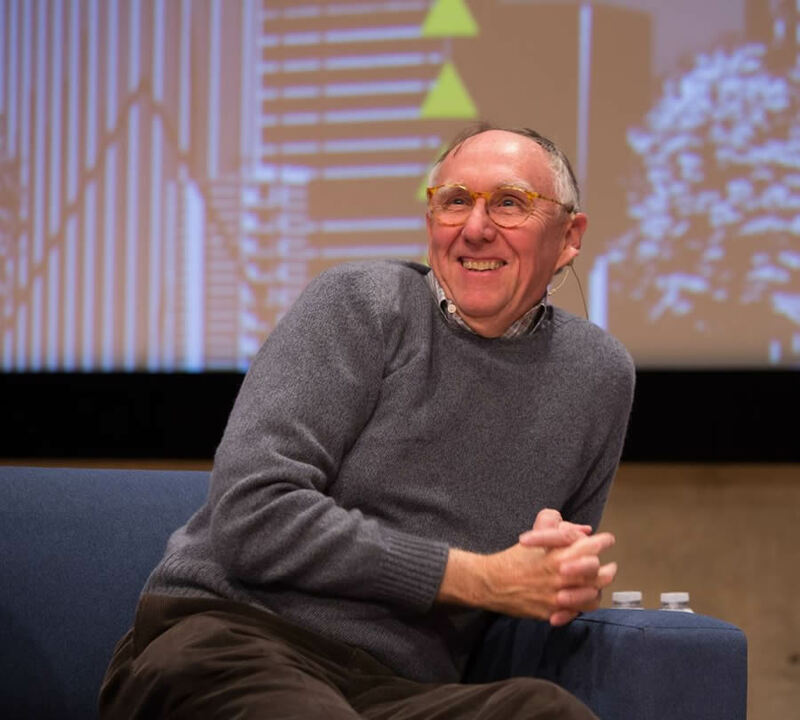 Esri president Jack Dangermond believes that geodesign will help drive the creation of a better future. Geodesign is a natural fit in fields like urban design, conservation, and landscape architecture, where taking geography into account in designs is a must. But geodesign concepts, methodologies, and technologies are starting to edge into new areas, including transportation planning, economic and real estate development, and even gaming. That transformation was in evidence during the 2015 Geodesign Summit, where speakers gave examples of how geodesign was integrated into computer games like Minecraft and in the analysis of tax revenue generation for redevelopment planning and walkability to city transit stops. 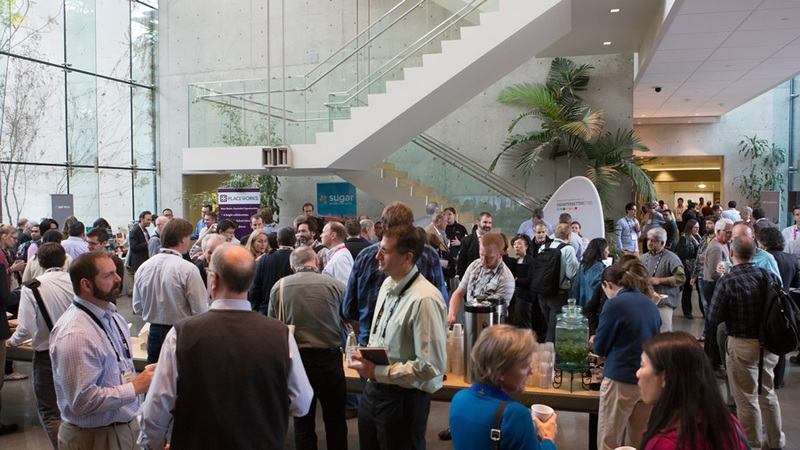 This year’s summit at Esri headquarters in January drew a diverse group of more than 300 professionals who work in planning, landscape architecture, engineering, real estate, development banking, government, academia, geography and GIS, and conservation organizations. Carl Steinitz (far left), Jack Dangermond, Thomas Fisher. and keynote speaker Noel Cressie discuss the possibilities, probabilities, and promise of geodesign. “Geodesign,” he said, “is both an ancient idea and a new idea supported by new and advancing technology. I see GIS integrating into almost anything we do.” Watch the video of Dangermond’s presentation. GIS data can be integrated into the video game Minecraft. Image courtesy of Sweco. Ulf Månsson from the Swedish sustainable engineering and design firm Sweco showed how geodesign was recently integrated into the popular video game Minecraft so players could create a city using real GIS data as a foundation. Gamers or the parents of gamers in the audience were intrigued by this idea. Månsson said he was a gamer as a youth. His son and his friends now build things together in Minecraft, using building blocks to create 3D virtual worlds. Inspired by seeing his son essentially do design work like he does at the office, Månsson created a method to stream geospatial data into the Minecraft server. Assisted by his Sweco colleagues, Månsson used GIS tools to help build the foundational land data for Blockholm, a replica of Stockholm, Sweden, that would go into Minecraft. They used, for example, Esri’s ArcGIS Data Interoperability, an ArcGIS for Desktop extension, to process real spatial data such as topography, waterways, roads, and property information and generate it in 3D. Blockholm was a project conceived by the Swedish Centre for Architecture and Design. 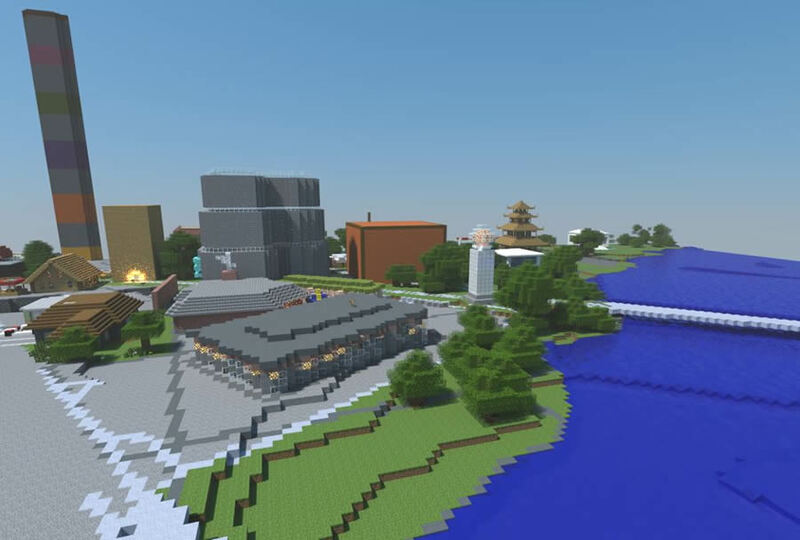 More than 10,000 Minecraft players later used the roadways, water features, and property information as a foundation to rebuild Stockholm as they envisioned it. 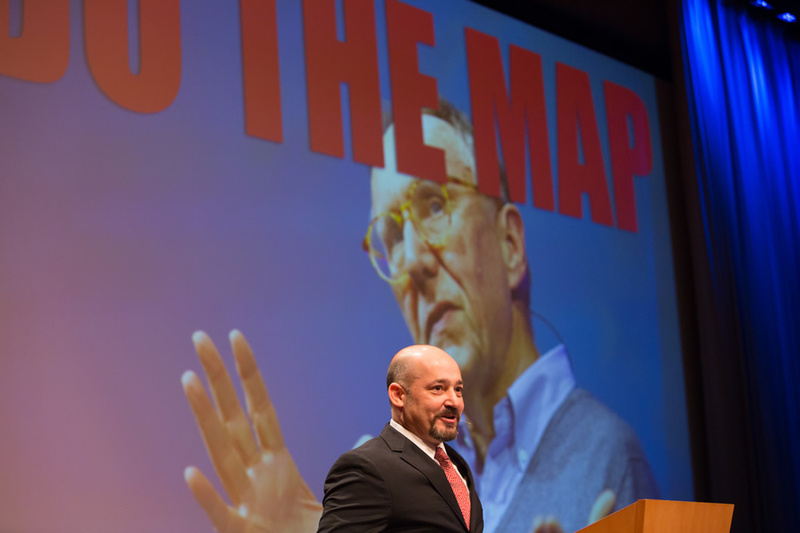 Joseph Minicozzi from Urban3 says it's important to listen to Esri president Jack Dangermond and "Do the Map." Blockholm essentially married “geo” and design in a virtual world. Joseph Minicozzi, principal of the econometric consulting firm Urban3 in Asheville, North Carolina, uses geodesign in the context of showing officials and citizens how downtowns of cities can be economically vital and viable compared to strip malls. Minicozzi showed maps of the taxable value per acre in places like Travis County, Texas, home to the city of Austin using Esri’s ArcGIS 3D Analyst extension. The highest spike on the map was downtown Austin. Another map showed a high spike for alcohol sales in downtown versus the mall areas in the suburbs. Attendees take a break to network and have refreshments at the Geodesign Summit. He mapped other tax flow data for Travis County, including mixed beverage and food sales per acre. “You see downtown popping off the map,” Minicozzi said. The maps starkly illustrate how buildings downtown can often generate much more property tax and city retail tax revenue than suburban strip malls, according to Minicozzi. He recalled hearing Dangermond once say, “If you put it on a map, people get it quickly.” That made an impression. The audience chuckled, but the value of the messages was obvious. Cities today strive to be more walkable and bike friendly, said Brown, Citilabs’ local government director. Studies show that people of all ages and income groups want to live in areas where they have easy access to jobs. They also prefer neighborhoods where they can do daily errands and participate in recreational activities without getting in a car, Brown said. The Sugar Access solution for ArcGIS features a unique hybrid desktop and cloud computing workflow, shown here analyzing walk access to bus stops in Fontana, California. Businesses want to move to locations near transportation hubs, universities, and hospitals plus understand the potential labor force within a reasonable commuting reach, Brown said. All of these attractive qualities in a community represent different aspects of a characteristic that urban planners call “accessibility.” Both governments and businesses need GIS technology to better understand how this dimension of transportation system performance affects their bottom line. Brown said Citilabs’ Sugar Access solution for ArcGIS measures and maps accessibility by multiple modes of travel to points of interest such as restaurants, jobs, government and health services, and local businesses, while also bringing in demographic data about the residents including information about the labor force. The software can help you test alternative scenarios, taking into consideration how new infrastructure or development projects might affect drive, walk, bicycle, or public transit times to various types of destinations. 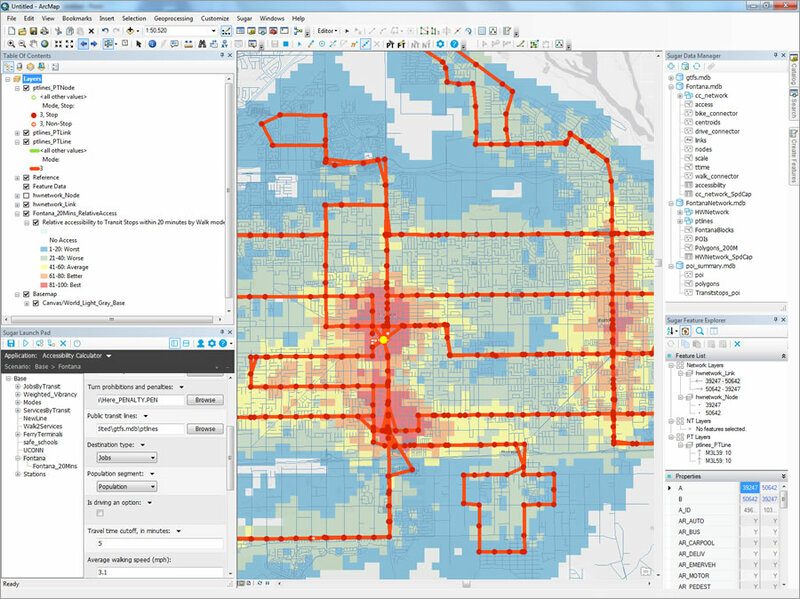 Sugar Access for ArcGIS also lets users import their own data, such as bike paths and, for 40 metro areas, incorporate Citilabs’ own proprietary Streetlytics database of traffic volumes, speed, and congestion for all streets. To demonstrate what Sugar Access for ArcGIS can do, Brown showed a map created with the software’s tools that displayed which areas within the city of Fontana, California, had the best, good, average, and worst bus service access within a 20-minute walk. This type of map better helps the city understand how its public transit system serves residents. “With Sugar Access and your local knowledge, you can plan and build a more livable city,” he said. The Geodesign Summit emphasized smart growth, sustainability, and habitat protection and mitigation, underscored by an interesting and thought-provoking lineup of speakers that included David Early from PlaceWorks, Zach Ferdaña from The Nature Conservancy, David Rouse from American Planning Association, and Mark Reiner from Non Sequitur. 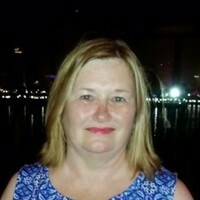 The keynote speaker was Noel Cressie, distinguished professor at the University of Wollongong in Australia and an expert in spatio-temporal statistics. He talked about how the use of conditional probabilities can allow spatio-statistics to handle uncertainties in the data and processes of geodesign. Listen to his talk. A suitability analysis for a hypothetical bus rapid (BRT) transit route takes into account proximity to parks and existing transit, as well as current and potential households and jobs. Dangermond underscored the importance of geodesign from the sustainability standpoint. He said he and botanist Peter Raven joined Paul R. Ehrlich, author of The Population Bomb, at a gathering of the California Native Plants Society. “It was a thrilling conference with thousands of people who were biophiliacs interested in plants and living things,” Dangermond said. Dangermond recalled that Ehrlich got up and told the audience that there was only about a 10 percent chance that in 100 years humanity would still go on. “This was very controversial to this audience,” said Dangermond, adding that Raven disagreed with Ehrlich—claiming it would only be a 1 percent chance. 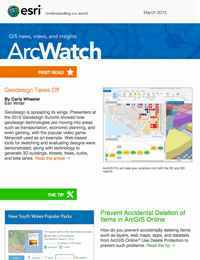 As Dangermond noted during the summit, Esri has worked hard to develop new and nimble geodesign technologies, including GeoPlanner for ArcGIS, the ArcGIS Pro application in ArcGIS for Desktop, and Esri CityEngine. Esri’s Rob Matthews demonstrated GeoPlanner for ArcGIS. He used the app’s tools to create a hypothetical Bus Rapid Transit (BRT) route through downtown San Diego, California, leveraging a geodesign approach. Next, he used the tools in the app to study planning issues at multiple scales, from a citywide BRT routing to the fine-grained placement of stations and evaluation of landuse regulations to support Transit Oriented Development (TOD) at the site scale. 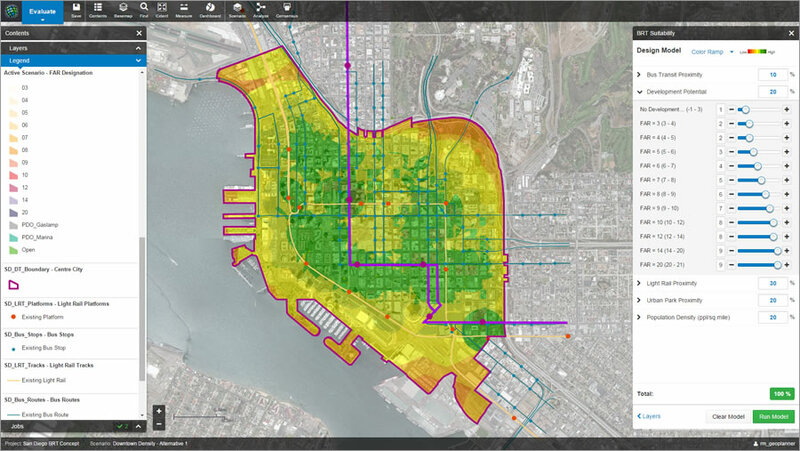 GeoPlanner for ArcGIS provides web-based tools for sketching alternative development scenarios while getting real-time feedback on the suitability of the design when measured against important planning metrics such as proximity to existing transit, parks, jobs, and households. 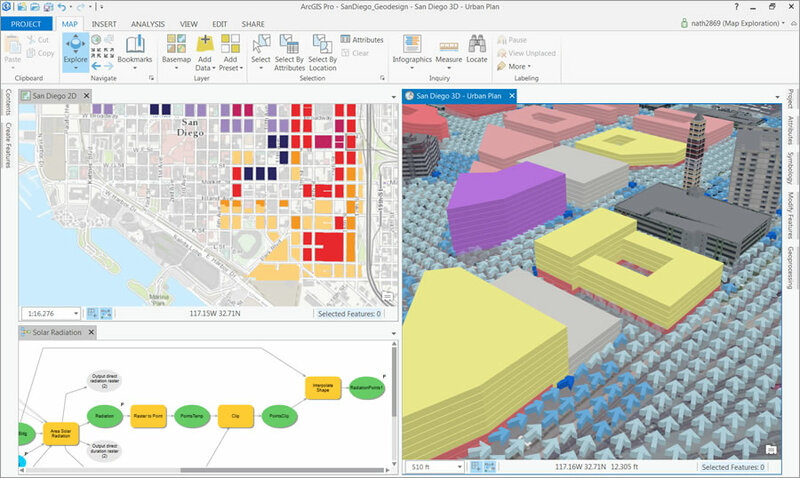 Using ArcGIS Pro, you can view and analyze urban planning data in both 2D and 3D, including complex analytical results such as the airflow between buildings. He also demonstrated the app’s capability to do live analysis in the cloud, such as walk times from proposed BRT stations, enriching design schemes with curated demographic data, and suitability for BRT station placement using a weighted raster overlay service. Matthews then demonstrated how you can use the app to compare project alternatives using a dashboard for key performance indicators. Finally, he prepared a higher density development option to export to ArcGIS Pro for further refinement in 3D. In his demo, Esri’s Nathan Shephard used ArcGIS Pro to take this downtown San Diego design down to a larger scale. Existing 3D buildings (courtesy of Pictometry) provided context around potential building development sites, and a proposed building outline was digitized in 2D using precision-editing tools. A synchronized 3D view rendered the simple shape as a constructed 3D building—complete with realistic texturing—by leveraging a CityEngine authored procedural symbol. A simple spatial query identified which buildings would impact existing underground water mains, and the results of previously run solar and wind analysis were explored to see if the design would create areas that could cause heat islands. A few such areas, with high solar radiation and low wind speed, were identified. Rather than use ArcGIS Pro to interactively place individual trees into the design to reduce the heat, Shephard said the problem was better attacked parametrically, as part of the street design process. Shephard then turned the demo over to his colleague Brooks Patrick, who demonstrated the 3D capabilities in Esri CityEngine software. CityEngine supports rapid design iterations, giving users the tools and rules to create a city, neighborhood, or even a street. 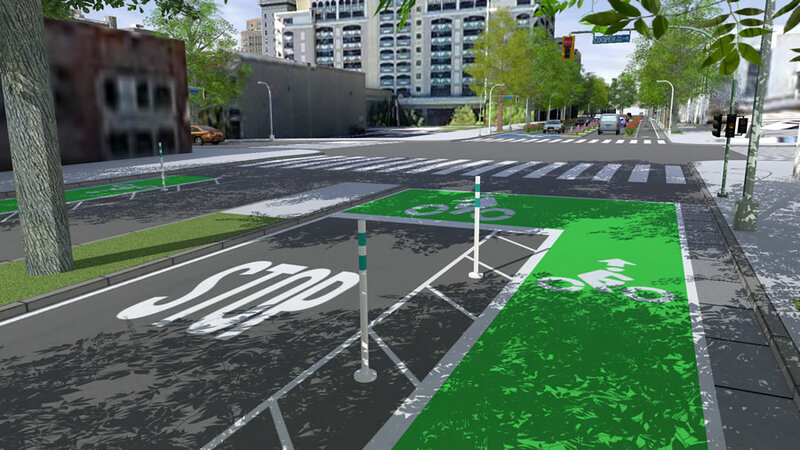 Different options for bike lanes, curbs, planters, markers, and trees, all in 3D, can be created using Esri CityEngine's Complete Streets. “This is made possible with the CityEngine procedural 3D modeling. If efficiency is important to your 3D pipeline, then you are really going to like this,” Patrick said. Using data from Shephard’s downtown San Diego demonstration, Patrick showed the audience Complete Streets, a “street rule” that incorporates knowledge and ideas from transportation planning guidelines and standards. He used Complete Streets to generate a default street then added bike lanes with widths such as 2.5 meters; 1.2 meter buffers for each lane; and then planters, curbs, and trees. Not only can you visualize the bike lanes, curbs, and trees in 3D, you can also use Complete Streets to get analytical reports on various aspects of the street’s geometry that will help you come up with rough cost estimates for construction work. “Planning our environment carefully—leveraging GIS, 3D, and the best possible design practices—will be critical for building a sustainable future,” said Esri’s Eric Wittner. If you are interested in learning more about geodesign and its applications, register to attend Geodesign Summit Europe, which will be held October 11–13, 2015, in Salzburg, Austria. The Geodesign Summit will return to Redlands January 27–28, 2016, with workshops and educational meetings scheduled for January 25–26. Make plans early to attend. 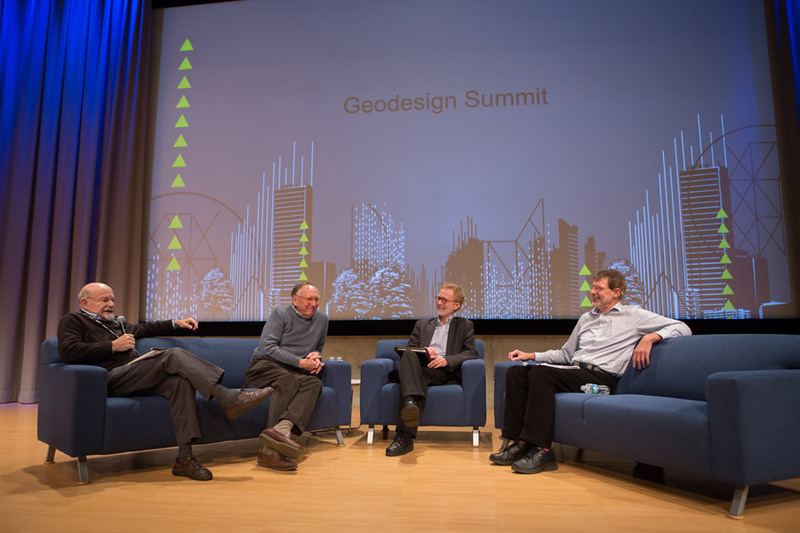 Visit geodesignsummit.com on a regular basis for updates or contact geodesignsummit@esri.com. Follow @geodesignsummit on Twitter.